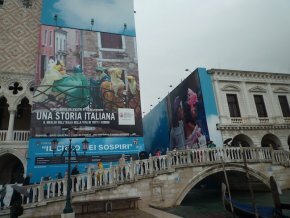 The situation is turning into a national scandal in Italy and an international petition has been launched by the British Committee for the Preservation of Venice, addressed to the Italian Cultural Minister, Sandro Bondi, signed by prestigious names from the art world  : the City of Doges has now been invaded by large advertising billboards, placed on façades undergoing restoration. 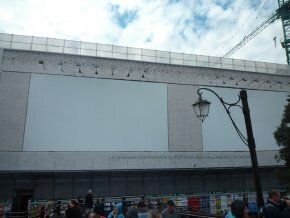 The advertisers, called “sponsors”, change periodically but the scandal appears to be a permanent one as some scaffoldings are to be up for three years and new work sites are started on a regular basis. 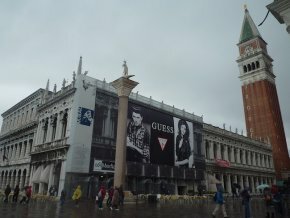 At the Piazza San Marco, tourists undaunted by the acqua alta are welcomed by a Trussardi billboard (ill. 1) while on the Piazzetta James Dean advertises for Guess (ill. 2). A few weeks ago, at the same exact spot, visitors saw John Travolta, “Professional pilot”, pitching watches for Breitling . 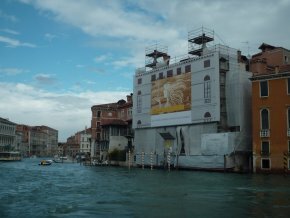 All of the Grand Canal is affected down to the prestigious Salute overrun by the Eni bank (ill. 5), a company which is particularly active in this sort of visual pollution. Indeed, it stands out also on the façade of the Palazzo Giustinian Lolin (ill. 6), right across from the Accademia which in turn is awaiting its “sponsor” unless there is break between two advertising campaigns (ill. 7). 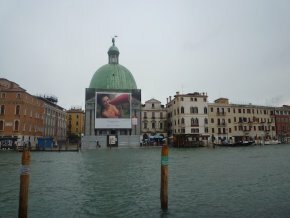 Visitors arriving in Venice by train were immediately faced on the opposite side of the station by the façade of the church San Simeon Piccolo hidden behind a billboard displaying Nomination jewelry (ill. 8). 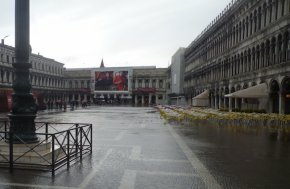 There is no way to avoid this visual pollution, which is in fact perfectly illegal as pointed out by the Giornale dell’Arte, although it has been approved by the Sopraintendenza ai Beni Architettonici e Paesaggistici and the city of Venice. The French are not the only ones to wonder at times why there are laws protecting historical monuments. Does the end justify the means and should we accept this type of spin-off by claiming it provides funding for the restoration of important monuments ? Having drastically reduced government subsidies for heritage, Berlusconi’s administration obviously shares the largest responsibility for this situation. “Patronage” thus tends to replace public funding with the ensuing consequences when not regulated. Yet, other solutions do exist and some companies are willing to fund restorations by having their names appear more discreetly on the tarps covering the scaffoldings. 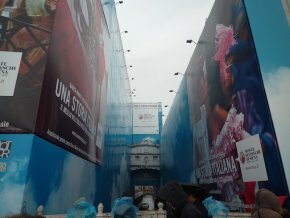 According to the Giornale dell’Arte, the supermarket chain, Esselunga, had tried to place a poster on the Ponte Vecchio in Florence last year but it had been removed almost immediately after vigorous protests with the mayor himself adamantly opposed. 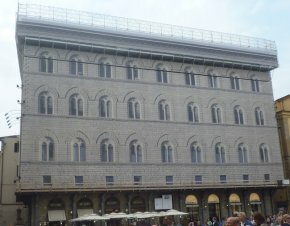 Currently, a palazzo overlooking the Piazza della Signoria is being restored but without any advertising on the tarp which, instead, simply reproduces the façade (ill. 9). Let us hope that international support will succeed in eliminating this unprecedented attack on a World Heritage Site. 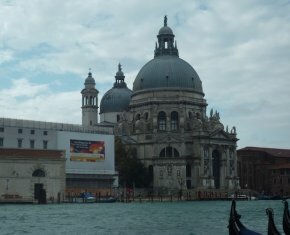 Some of the names include Norman Foster, Mark Jones, the director of the V&A, Neil MacGregor, the director of the British Museum, Mikhail Piotrovsky, the director of the Hermitage, Martin Roth, the director of the State Museums in Dresden…Check out the petition on the website Venice in peril. The photo was published on the Giornale dell’Arte in October 2010.